Portofino Beach Resort Puerto Galera, home away from home. The Portofino Beach Resort Puerto Galera is nestled right on the beach at Small La Laguna Beach in Puerto Galera. 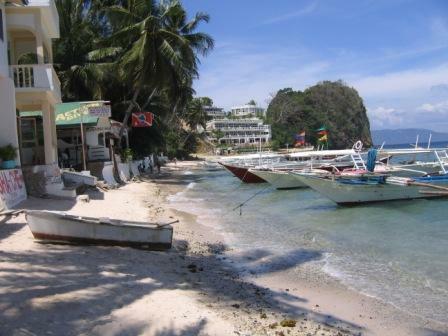 I find it ideally located, being on the middle beach of the three main beaches in Puerto Galera. All the times I have been to the Portofino Beach Resort I have always been made to feel welcome, as though I'm coming home rather than on holiday, the staff really do put you at ease. The Portofino Beach Resort Puerto Galera has air conditioning in all 25 of it's units and trust me when I tell you that air conditioning is a must! One of the other benefits of units at the Portofino Beach Resort is they all have there own cooking facilities, if you want to keep your costs down. Mind you the in house restaurant is not exactly expensive and they do provide a good variety of food. There is a bar down beside the pool, which is a great place to sit in the afternoons and enjoy the sun setting over the Verde Passage, before you move on to Sabang for some more nightlife and restaurants. You really do have an amazing choice of nocturnal activities. This area of Puerto Galera has been built on the back of the diving industry, Puerto Galera Diving has some of the best in the Philippines if not the world. The Portofino Beach Resort Puerto Galera, can also get you wet, either scuba diving or snorkeling. If you have never scuba dived, then I highly recommend it and you will not be disappointed, the shop and the boat are within a couple of metres of each other and the dive sites are all within 15 minutes of Portofino Beach Resort. Portofino Beach Resort Puerto Galera - How much will it cost? 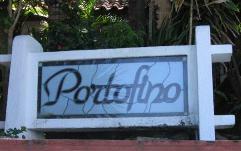 You can get an idea of how much accommodation at Portofino Beach Resort Puerto Galera will cost you here. Or have a look at Tripadvisor's recommendations, compare prices and bookings for Portofino Beach Resort. Whilst Small La Laguna Beach has an enormous amount to offer, lying on the beach is not one of them, as you can see from the photo above, there is not really a lot of beach for lazing around. At high tide the water comes right up to the walls. If you want to laze on a beach then I suggest you follow the beach around to Big La Laguna Beach, which is just over the headland and less than a five minute walk. The reef off the point, which divides Big La Laguna Beach and Small La Laguna Beach is great for snorkelling, so if you are in between dives and just have to get wet or you are not really into scuba diving, don't despair, you will still be able to feast your eyes on the underwater world that has made Puerto Galera what it is today. For the best ways of getting to Puerto Galera and Big La Laguna Beach have a look here. Now if you want to stay closer to the nightlife and action of Sabang, you do have so accommodation options. Have a look here. Have YOU stayed at the Portofino Beach Resort Puerto Galera? Share your tip or review on the Portofino Beach Resort with everyone!